Most clove bud trees are grown in Indonesia and the African island Zanzibar. Clove bud essential oil is steam distilled and used to flavor food. 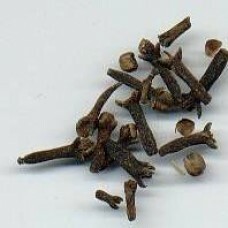 Clove bud oil is one of the most potent antiseptics. Clove bud essential oil gives heat to liniment, helping relieve muscle and arthritic pain. Clove bud essential oil also has the ability to abate depression, relieve indigestion, and contribute to sexual stimulation. Clove Bud Oil Scent: Sweet-spicy, slight fruitiness, woody. Clove Bud Oil Uses: Numb toothache, stop infection, flu, colds, bronchitis, athlete's foot, muscle pain, reduces drowsiness, relieve indigestion, sprains, strains.